Round two of our groups series saw three more classes. 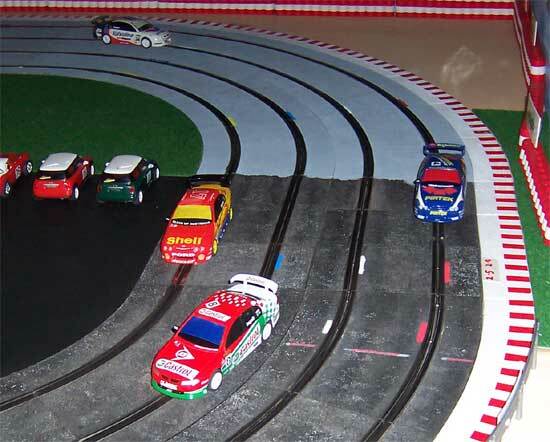 The first class to run for the night was NC1 Classics which is a modified version of the old Ninco Classics series. This was done to allow the use of similar cars from Carrera and Monogram and Pink Kar with the use of NC1 engines and Ninco parts if required. The field ready to race. 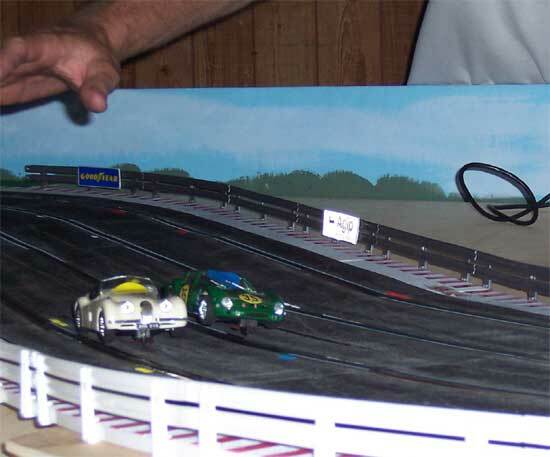 Devious Dave with the Green Pink Kar Ferrari 250 GTO and myself with the Carrera Mercedes 300SLR are the only ones to take up the challenge so far and race tune some new cars to the field. 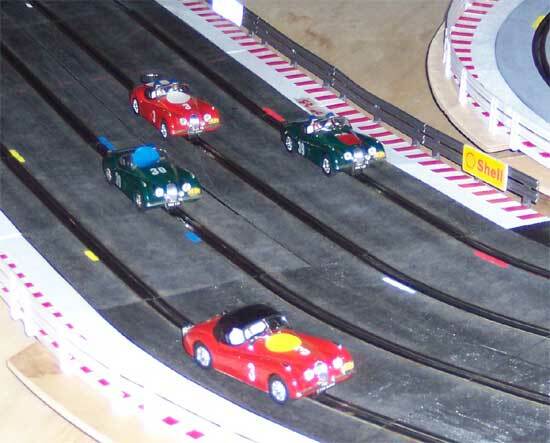 The results finished up with Joe Ninco XK120 in P1, Jamie in the red XK120 with top in second and the gamblers myself in third and Devious Dave in forth. The car to beat at present is the Ninco Jaguar XK120 with Joe still being the man to beat with his Green open top version in the blue lane. Dave deslotting due to one of the new runners in Jamies other Rent a Jag coming out accross his lane. Bumps hand is descending from the clouds like the saviour about to rescue the unfortunate. Charlie finds the Healy a touch tippy through the hairpin. The second class for the night was host V8's. A few of us donated cars for the series which will run over four rounds during the year. Bo and Joe put in some great work to get the series up and running and it proved to be close at the pointy end. 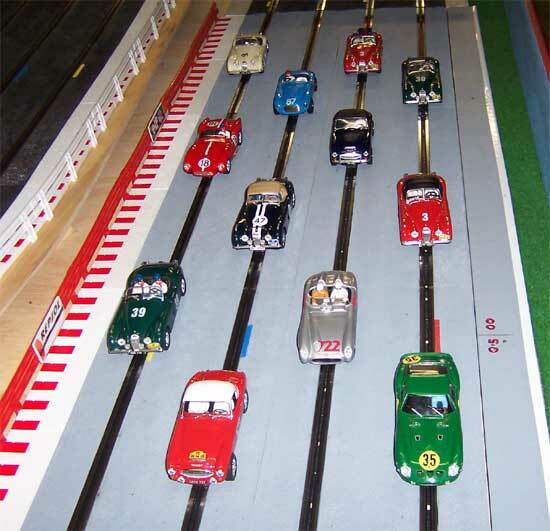 Each car is assigned a lane and each driver races the cars across the lanes. 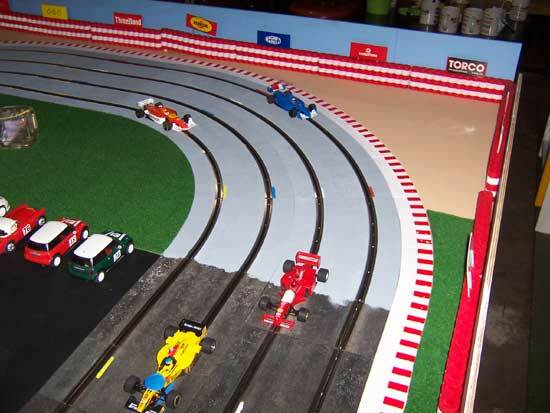 This was how a lot of the races started and ran until the rubbing of paint took it's toll and forced someone off. 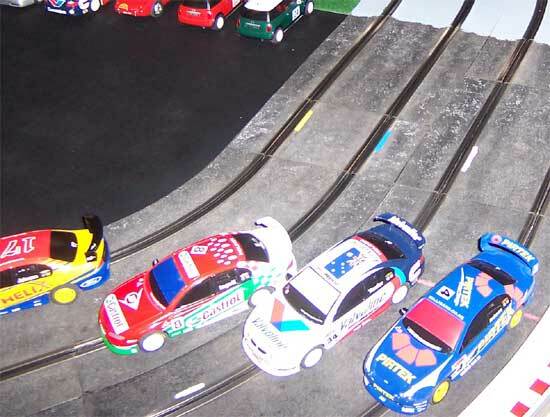 This class was the closest racing we have had with all driving the same cars but there was also a bit of tension starting too. In the end I had a hard fought win by .01 of a lap out of around ninety or so laps. I think Jamie was second with Joe third but I have not seen the official results as yet. I do know that the first half dozen were less than a lap apart so There is nothing in it. 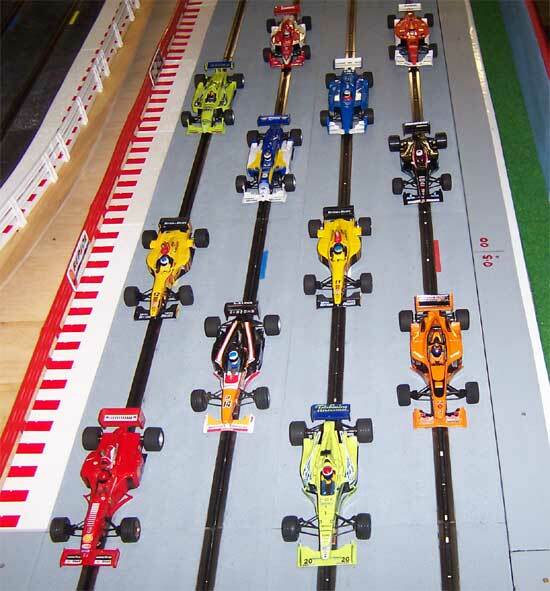 The final class was the Open Racing Class that consisted mainly of Ninco F1's and Indy Cars running NC5 and NC6 engines and SCX F1's and Indy Cars running Pro Turbo motors. 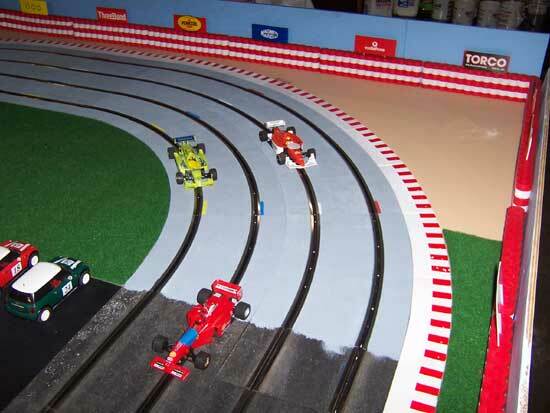 Joe is driving the Ninco Ferrari followed by Charlie in the Ninco Indy car and Al with the SCX Indy. Here Bo with the Ninco Jordan leads Joe, Al and Chris in Devious Daves rentadrive Ninco Indy Car. 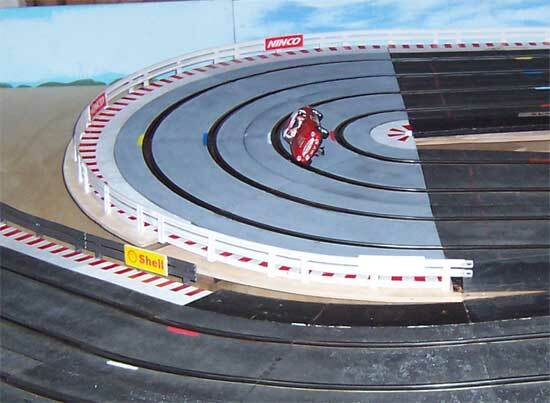 I was on a roll last night and had another win followed by Joe and Jamie with the SCX Minardi with Ninco rear tyres. Thanks Bo for hosting another great round. As always great pictures. The lineup of Classics looks great. Vinno, The action shots are fantastic. Devious. And here's hoping the new Corvette will help break up the Jaguar dominance. One day we must get a video of a lap or two of them going around. I still find it amazing how quick they go and how beautifully the well-tuned ones handle considering they're NC-1's and no-magnets. Their lap-times are not too shabby at all considering that long main straight gives cars with bigger engines a real advantage. I also noticed that fitting a sprung guide to my Ferrari 166 was a worthwhile improvement, so I'll be fitting them to my other classics.